My mother-in-law Carlene, was an excellent cook. 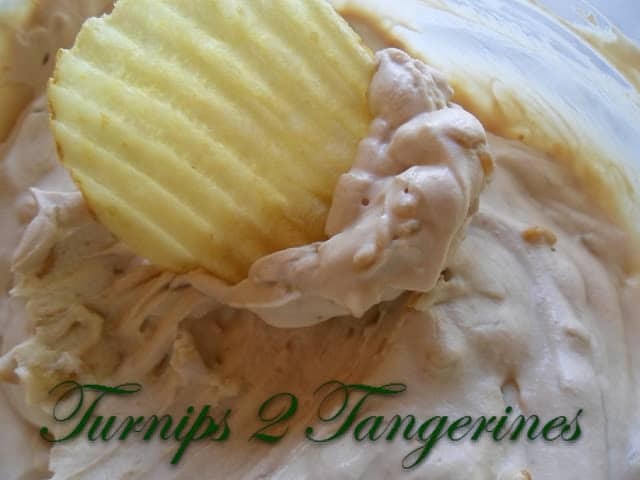 She made this wonderful chip dip for every family gathering and it was a must have at every Packer Game Party. Carlene’s onion chip dip was legendary. Like I stated, her chip dip was at every single family function. Why? Because if Carlene’s chip dip wasn’t on the table next to a big bowl of ruffles potato chips, there would be hell to pay!! Lipton’s Onion Soup Mix Only, per Carlene’s orders. My mother-in-law is no longer with us but every time I make this dip, I think of her and all of the fun times we had at my in-laws house. Carlene loved having her family around her. Any occasion was an occasion to get together. Carlene sent cards for every single holiday under the sun. Birthday’s were considered super special and birthday’s were “bakery cake” worthy. She always made me feel like I was 5 years old on my birthday and I loved it! Carlene said that the secret to making this dip ‘just right’ was to beat the hell out of it. Carlene’s words, not mine. She said the more you beat this dip the better it gets and I’d have to agree with her. (She’d get a kick out of that statement because her and I didn’t always see eye to eye:) Anyway, beat, beat and beat some more. I’ve made this dip many times but no matter how many times I make this dip, it never tastes as good as hers! My mother-in-law made this dip for every occasion. It just wasn't a party without Carlene's chip dip. With electric mixer, beat cream cheese until smooth. Add milk, one tablespoon at a time, (add more or less milk, depending on how thick you want the dip to be), add remaining ingredients. Beat well. The more you beat this dip, the better it gets. New follower from Let's Get Social Sunday. Love this recipe and your blog. Would love it if you stopped by to see me. Have a great day! Thanks for stopping by! I stopped by your blog and your post was Great~ Every girl needs a Virgil! Following you back on "Linky"